Rogue Women Writers: THE REAL BOOK SPY + ROGUE WOMEN = SUSPENSE, DRAWINGS, & FREE BOOKS! 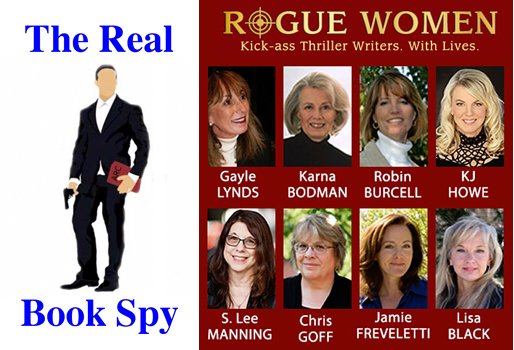 THE REAL BOOK SPY + ROGUE WOMEN = SUSPENSE, DRAWINGS, & FREE BOOKS! Exciting news: The Real Book Spy & Rogue Women Writers have formed a lethal alliance!! What can Rogue Readers expect? On the second Friday of every month, Rogue Women Writers will publish a new The Real Book Spy's Rogue Recommendation, highlighting a thriller that sizzles with entertainment, breaks boundaries or in some way stands out as "Rogue." The blogs will be uniquely his and may include, among other things: author interviews, author blogs, reviews and photos. Who will the hero, heroine or villain be? You tell us! Every few days leading up to the 10th, we'll be posting more clues. This is your chance to win more than just bragging rights! Can you figure out who wrote what book before the big reveal? Tell us your thoughts, ask a question or hazard a guess in the comments section, and you'll be entered into a drawing for a copy of The Real Book Spy's May Rogue Recommendation. So excited about this collaboration!!! Yes, more books. This just fuels my addiction. It's totally thrilling to be in cahoots with the great Real Book Spy! His Rogue Recommendations are going to be Rogue Riveting ... I'm waiting, waiting, waiting for the first one!